IAC has been a key manufacturer of steel laboratory furniture since 1991. Entry into the laboratory market was inspired by IAC's award winning Dimension 4 (D4) Modular/Adjustable workstations. These versatile workstations were originally developed for markets apart from laboratory environments, however it wasn't long before the laboratory managers and architects discovered the value and application of the D4 adaptability within lab environments. This Dimension 4 adoption in labs inspired the design of the LD-4 Adaptable Tables that incorporate significant structural enhancements to support standard laboratory table tops (TRESPA/Phenolic Resin, Epoxy Resin, Stainless Steel, Chemsurf and of course standard Plastic Laminate). LD-4 Adaptable Tables offer the diversification needed to furnish any laboratory environment, with a wide variety of sizes, finishes, shelving and storage options. The LD-4 is perfect for any laboratory, whether as a versatile standalone table, linked as continuous line, or configured as a double-sided island. There are really no limits with LD-4 Adaptable Tables. Adaptable, Modular and flexible in design and concept (Versatility within any Laboratory environment). System includes Starters and Adders. Single (one table top) and Double Sided (two table tops). Ideally suited for in-line applications, islands, returns, adaptability and mobile functionality. Can be used in stand-alone applications – the bench can include optional suspended cabinets, lab casework and/or overhead storage whether as a stand alone station or combined with other stations. Total workstation capacity is 750# static load, evenly distributed. 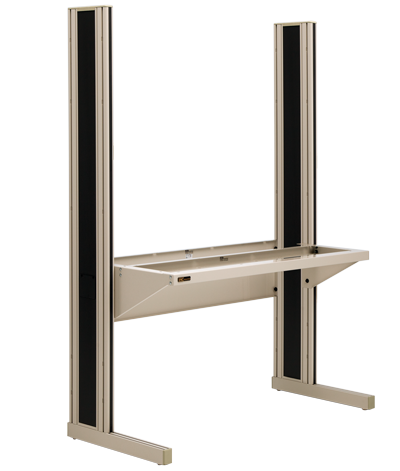 This system is a sold as a frame only, providing options for different types of chemical resistant specialty surfaces. Unique two-piece extruded aluminum construction. Captive nutway in aluminum provides infinite adjustment points for accessories – remember to review your electrical outlet placement when thinking about positioning accessories along uprights. Milled nutway ports provide easy assembly and accessory add-on at a later date. Uprights securely bolted to custom 2″ x 3″ aluminum base support. Slide-in accent/trim strips provide contrast color in uprights. Plastic top and end caps provide finished appearance. Single sided stations have a 16 Gauge 13″ high modesty panel that attaches to each upright. Pair of 12 gauge formed steel table top brackets. 2 each 16 GA table top supports beams. Manual height adjustment is standard. Hydraulic hand crank and motorized height adjustment is an option. Infinitely positioned on the uprights using 5/16″ square head bolts. Frame color matches paint selection for the uprights. All table tops are options. Single sided (one table top) & double sided (two table tops). Overall bench length is 2-1/8″ longer than table top. Edge of table top comes to the middle of the upright. Lab-top Trespa .75 thick table tops. Epoxy Resin 1″ thick table tops. Many specialty table tops available. Many Configurations of Eclipse Laboratory Grade Steel Casework can be suspended from LD-4 tables. 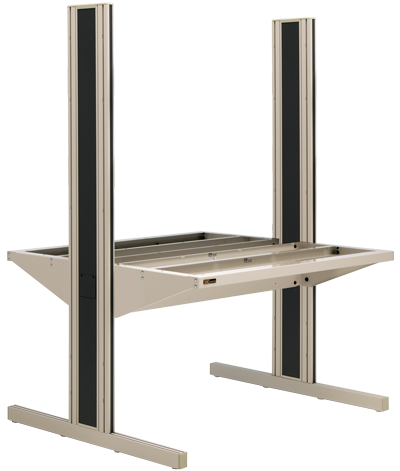 The following specifications are for standard LD-4 cabinets, for suspended casework please contact your Eclipse Laboratory Specialist or reference the casework section of this catalog or online. 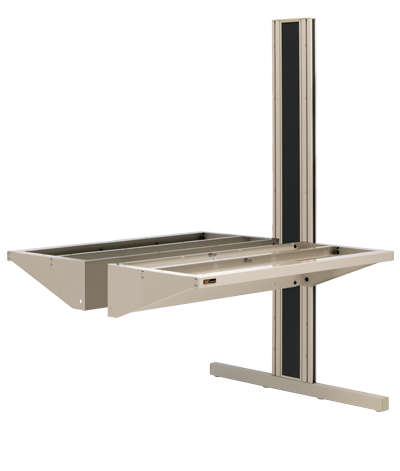 Many configurations of laboratory grade wall mounted cabinets can be mounted between the uprights of the LD-4 tables. The following specifications are for standard (non-wall mounted cabinet derivatives) LD-4 cabinets, for overhead secured laboratory wall cabinetry please contact your Eclipse Laboratory Specialist. Corner tops & shelves available in radius and square back treatments. Available in standard laminate, Trespa and Epoxy Resin. Corner tops supported by 12 GA support brackets that are adjustable the same as the table tops. Corner shelves supported by 12 GA shelf brackets that attach to the uprights and are adjustable up and down. Radius corner tops have a 150lbs weight capacity, evenly distributed. Radius corner shelves have a 75 lbs weight capacity, evenly distributed. Square corner tops and shelves include an adjustable rear tube supports. Square corner tops have a 350 lbs weigh capacity, evenly distributed. 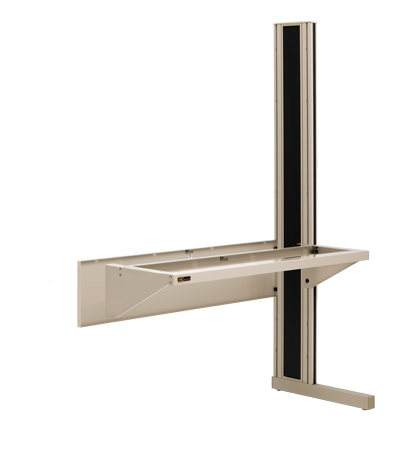 You can suspend cabinetry with special size corner and support frame – please contact your Eclipse Laboratory Specialist for additional information. Provides storage area off the table top. Shelf can be mounted in front or back nutway for further positioning options. Best suited for stand-alone applications. Integrates power into the workstation. Supplies additional outlets located in the uprights. Each workstation will have 6 outlets located on the inside trim panel of each upright. Electrical is pigtailed allowing power to be pulled from the top of the upright or from the bottom of the upright or underneath the upright. Duplex configured outlets are not flush with the trim panel. Duplexes may affect location of accessories. Best suited for in-line applications. UL Listed as part of workstation (UL 962 / File # E113928). Integrates 4 independent 20 Amp circuits into the workstation. Four 15-amp (20-amp optional) duplexes above the table top. Uprights are interconnected below table top with molded interconnect cord. Each duplex receptacle numbered "1", "2", "3", & "4". Duplex configured outlets are flush with the trim panel. 7-Wire power up cable must be ordered separately. Any or all circuits can be turned off at the power source. Same for single sided or double sided stations. 36″ channel include 2 duplex outlets, 15 Amp Rating at 120VAC. 48″, 60″, 72″ include three duplex outlets, 15 Amp Rating at 120VAC. Power switch and pilot light included. Aluminum Channel mounts to uprights with 14 Gauge brackets. Suspended between uprights, not mounted to table top. Positional where electrical access is needed. Accepts laboratory standard parts cups. Heavy duty construction using IAC universal extruded aluminum rail and mounted by 14 gauge mounting brackets. Height adjustable within infinite upright slots. Depth adjustable within slotted brackets. Offers all of the above adjustability features. Adds angle adjustment capability via Phillips set screws on side of rail. Tilts bins at an ergonomic angle for ease of reach and parts access. Ergonomic benefits for sitting and standing applications. 1″ bright zinc plated "U" shaped tube. 12 gauge textured black painted brackets. Unique 14 gauge ratcheting textured black painted brackets. Manually adjusts in and out. Promotes good housekeeping – can be raised for cleaning under the bench. REMEMBER: Footrest or Rail may interfere with suspended or mobile cabinets. Ensure that you double check your specification and approval drawings. Attaches to standard or ergo footrest tube using plastic C-clamps. Adjustable angle provides optimum comfort. Painted same color as bench. Rounded corners provide safe edges for operators. Provides a stable floor for seated or standing workers. Can be moved where needed. Same hands free operation as ergo footrest. Adjusts from 2.75″ to 11.5″ from floor. 14 gauge base measures 15″ x 28.5″ – Includes non-skid rubber feet. Pan tilts in continuous movement for optimum comfort angle. Heavy Duty 14 gauge brackets support the light fixture. Hand knobs lock light fixture at desired angle. Prismatic lens diffuser included with the standard light fixture. Convenient power switch at front of light. IAC products at work in a variety of environments and applications.